the XXIII. Reserve Korps had thrown the enemy back over to the west bank of the Yser Canal between Steenstraat and Het Sas. the XXVI. Reserve Korps had broken through the Allied front as far as a line from the south of Pilckem to the north-west of St. Julien. However, the Belgians and the British were stubbornly defending the two important Army boundary junctions at both ends of the German line of attack. The continued success of a German advance towards Ypres or the consolidation of the new line would have to deal with this in order to avoid getting the German troops into the dangerous situation. Their soldiers could find themselves trapped in a salient. This would be disadvantageous in so far as the German left, right and even rear flanks could be exposed to attack. The successful effect of the gas on the central area of the attack enabled the rapid, unhindered advance by the 52. Reserve Division towards Pilckem Ridge. The French were surprised and terrified by the horrific effects of this gas. The way in which these soldiers abandoned their positions and fled for their lives shows how the new weapon caused not only a physical effect. It also produced an extreme psychological reaction - wild panic. However, at both the right and left ends of the German attacking line there were problems with the emission of the gas. On the right end of the German attack at Steenstraat the batteries of gas cylinders had not released their gas successfully. The wind direction had actually blown the gas cloud further to the south into the French sector instead of westwards across the canal towards the Belgians. This meant that the Belgian troops holding the junction of the Franco-Belgian Boundary at Steenstraat were relatively unscathed. They were able to defend the Allied line at an important junction. They then had a hold on a position on the west of the broken Allied line and, therefore, were able to pose a threat to the right flank of the German attack. On the extreme left end of the German attack the Canadian 3rd Brigade was holding the left of the British line on the Franco-British Boundary. The front along which the gas was released was not extended as far as the Canadian font at the Franco-British Boundary. The troops of the two Canadian battalions in the line and those in reserve at St. Julien were initially unscathed by the gas cloud. 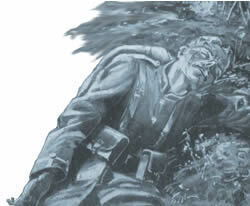 Some French soldiers in the 1st Company Tirailleurs, who were on the far right of the French line near the Franco-British Boundary, also escaped the effects of the cloud because it was not released directly towards them. This enabled the Canadians and some French troops to put up a defensive flank facing a north-westerly direction at the junction of the Franco-British Boundary. The history of the 238 Reserve-Infanterie-Regiment of 52. Reserve Division(1) comments on the major flaw of such a chemical weapon in its total reliance on the wind and the weather. The attack was postponed a total of three times. Even on the third attempt at successfully releasing the gas from the canisters, the wind dropped on the early morning of 22nd April. This prompted the German commanders, some of them reluctantly, to move the attack to the late afternoon. Their hope was that it could be carried out after all now that the troops were in their attack positions for a third time. The 213 Reserve-Infanterie-Regiment (2) history writes that the 46. Reserve Division commander (Generalleutnant von Hahn) and the XXIII. Reserve Corps commander (General von Kathen) expressed their concerns about launching an infantry attack following the gas in broad daylight. Not wanting to prolong the tension of this frustrating ‘on/off’ situation for the gas attack the 4th Army headquarters issued the order to go ahead with the attack in the afternoon. In many respects this considerably weakened the impact of the attack. From a tactical standpoint the delayed launch of the attack starting as it did late in the afternoon, meant that the German troops would have to fight on into the hours of darkness. The further deployment of troops to follow up a successful attack would then be put at a disadvantage by having to move into the battle zone after dark. If the Allies had damaged the German front line trenches in the days leading up to 22nd April, the course of events would have been very different. Indeed the Second Battle of Ypres may not have happened at all. The aim of gas attack on 22 April was to try out a new weapon. The trial was carried out by the German 4th Army. The speed of the German advance along most of the attack frontage was a pleasant surprise to the German troops. They were keen to get out of the stalemate of trench warfare, even if they were unsure about the morals of using such an unpleasant method on the enemy. However, the days following the initial success were to prove extremely difficult and costly in German casualties. This was due to the fact that this attack was classified as a localised attack by the German Chief of General Staff, General von Falkenhayn. The 4th Army had been urged not to push the advance to try to take distant objectives. It had not, therefore, been provided with sufficient reserves to follow on behind, to consolidate and exploit a victorious breakthrough of the Allied front in the Ypres sector. Had this been the case, the outcome of the battle may also have been quite different. 51 guns (including 4 heavy British and 4 heavy French guns) and 70 machine-guns. The huge German 42cm “Dicke Bertha” siege gun. 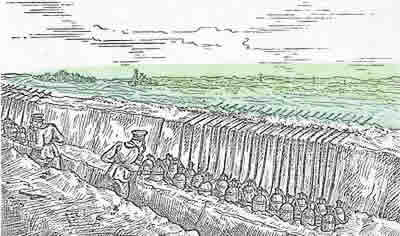 During the night the German troops dug into the positions in the new line they were holding. In order to disrupt the movement of Allied reinforcement troops passing through or near Ypres into the Ypres Salient	the German artillery was aiming heavy fire targetting the Yser Canal bridges near Ypres and the town of Ypres itself. As far as the Germans were concerned, the situation for the enemy in the Ypres Salient had changed considerably. In an attempt to recapture this sudden crucial loss of ground bloody counter-attacks would soon be taking place against the new German positions. The relative calm of the sunny afternoon of 22nd April had been shattered with a devastating and frightening new development in modern warfare. 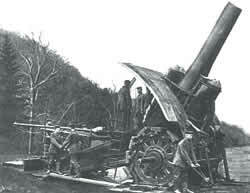 Photograph of Big Bertha 42cm howitzer in action courtesy of Wikimedia Commons.